I stood at the window watching the cocoon, which hung in the winter air like an upside–down question mark. That was the moment... I understood. Really understood. Crisis, change, all the myriad upheavals that blister the spirit and leave us groping– they aren't voices simply of pain but also of creativity. And if we would only listen, we might hear such times beckoning us I stood at the window watching the cocoon, which hung in the winter air like an upside–down question mark. That was the moment... I understood. Really understood. Crisis, change, all the myriad upheavals that blister the spirit and leave us groping– they aren't voices simply of pain but also of creativity. And if we would only listen, we might hear such times beckoning us to a season of waiting, to the place of fertile emptiness. To ask other readers questions about When the Heart Waits, please sign up. What are the reflection questions that was contained in this book? THIS IS MY FAVORITE THUS FAR: WAITING...IS THE REAL CRUCIBLE OF SPIRITUAL TRANSFORMATION. Too true when you think of God's plan "for the fullness of time." The long awaited fulfillment of prophecy, all those barren women pleading to God, the emprisonments, the wanderings, the exiles, the captivities. "We tend to forget, I think, the power of a symbol to mediate grace and move us towards change." - Kidd. Too true. Kidd's is a cocoon, mine has always been an egg and only this year have I been attacked by unexpected circles/openings - a black hole, a birth canal, an internal oculus. "We went on to heaven the long way round." & "Nothing can be more useful to a man than a determination not to be hurried." - Henry David Thoreau. This 'long way round' is the nature of life, and it calls to mind the Exodus yet again. Again, a theme of all life but especially mine, I have my eye out for the Exodus in all things. I loved this book and would recommend it to anyone who is going through a change and questioning it's pace, purpose and/or meaning. "When the heart weeps for what it has lost, the Spirit laughs for what it has found" (118). "Love consists of this, that two solitudes protect, and border, and salute each other" (167). "I'd spent a lot of my life wearing masks to fit the occasion, being everything to everybody even if that mean being someone other than myself. Now, after long months of passionate wait I loved this book and would recommend it to anyone who is going through a change and questioning it's pace, purpose and/or meaning. "I'd spent a lot of my life wearing masks to fit the occasion, being everything to everybody even if that mean being someone other than myself. Now, after long months of passionate wait and labor pains, it seemed that I was birthing more of my True Self. The real thing" (197). "The tree full of butterflies spoke to me of the authenticity beginning to unfold inside of me, the wobbly new wings opening up...newness in my life...learning to lover herself and be in touch with her soul, to be here now, to become Delight and play with God" (198). Amazing book! This is a book that needs to come into your life at the right time. If you are not connecting to it, then it is not the right time for you to read it. This book came to me at the perfect time and helped me to get through a long period of waiting and change. I don't recommend reading this book straight through quickly. It needs to be read slowly, one section at time. This book has been a God-send to me throughout the years. I first read it during a difficult time in my life and it was instrumental in pulling me through. I have since bought copies for friends and relatives, some of whom feel the same way I do. For anyone dealing with a personal crisis or has ever faced an internal struggle at all, this book is a wonderful tool. I loved this book because of the time I read it in my life when things were just not happening the way I thought there would professionally. Since I am comfortable in the reflection part of life, this books reminds you that the waiting period is where alot of your growth and learning occurs. One of my favorite books I've read and often encourage others to read it too. I have read both The Secret Life of Bees and The Mermaid Chair; the author of those novels wrote this spiritual work some twelve years before writing the novels, and I very much enjoyed both the novels and this nonfiction book. The essence of this book is that a vital part of the spiritual transformation process is waiting; that one cannot always be doing, but that one must also wait on God and on His timetable. The author’s main metaphor is that of the transformation of the caterpillar into the I have read both The Secret Life of Bees and The Mermaid Chair; the author of those novels wrote this spiritual work some twelve years before writing the novels, and I very much enjoyed both the novels and this nonfiction book. The essence of this book is that a vital part of the spiritual transformation process is waiting; that one cannot always be doing, but that one must also wait on God and on His timetable. The author’s main metaphor is that of the transformation of the caterpillar into the butterfly; it is quite a leap of faith for a caterpillar to enter a chrysalis to become transformed. This book also deals with midlife crises, and with the various kinds of traps that one can fall into. It is far easier to do rather than to wait, and in our day and age it is harder than ever to do nothing. I liked the book and her ideas about the chrysalis and the need to wait. I found she wrote a lot about God and is obviously religious and saw her evolution in relation to her relationship with God. That kind of turned me off because I am an agnostic. I don't see my evolution in relation to a God at all, I see it in relation to myself. I found that she relied very heavily on God and that I had to force myself to finish the book because I liked some of her ideas. I like her fiction books a lot and I liked the book and her ideas about the chrysalis and the need to wait. I found she wrote a lot about God and is obviously religious and saw her evolution in relation to her relationship with God. That kind of turned me off because I am an agnostic. I don't see my evolution in relation to a God at all, I see it in relation to myself. I found that she relied very heavily on God and that I had to force myself to finish the book because I liked some of her ideas. I think that this book is a great read for anyone who is in a season of waiting as I am in or if you work in counseling others in times of crisis. I love how the author shares her story without speaking as if her way is the only way. She tells her story as if you are right there listening to her tell you about a hard season of life. I "discovered" Sue Monk Kidd when I finally read her breakout novel and watched the movie, "The Secret Life of Bees." I enjoyed so many things about her writing that I wanted to read more and was delighted to learn that she writes nonfiction as well as fiction. In "When the Heart Waits," Kidd takes us along on her spiritual journey of discovering who she really is. She offers no simple answers or shortcuts. Like the ancients, she finds the spiritual disciplines of solitude and simplicity essentia I "discovered" Sue Monk Kidd when I finally read her breakout novel and watched the movie, "The Secret Life of Bees." I enjoyed so many things about her writing that I wanted to read more and was delighted to learn that she writes nonfiction as well as fiction. In "When the Heart Waits," Kidd takes us along on her spiritual journey of discovering who she really is. She offers no simple answers or shortcuts. Like the ancients, she finds the spiritual disciplines of solitude and simplicity essential in finding our true selves. Waiting is not something we do well in 21st century North America; just as instant gratification is a reality for our physical needs, we expect spiritual transformation to happen on our timeline, not God's. But Kidd reminds that the transformation happens in the waiting - in the dark places - as illustrated by the cocoon and butterfly that emerges after a long period of darkness and waiting. I rarely find a book (other than reference) that I want to keep going back to, but this is one. Over 15 years ago a spiritual director pointed me to this book. Timing matters. I know that I read through Monk's personal journey, but it didn't resonate with me then. Now every page found home in me. I cannot really read without writing and underlining, (nor can I write without reading). Happily, I realized this was a keeper and returned the library copy and got one of my own to enjoy and digest at leisure. As I write about life changes and the process of transition, I found Monk's thoughtful Over 15 years ago a spiritual director pointed me to this book. Timing matters. I know that I read through Monk's personal journey, but it didn't resonate with me then. Now every page found home in me. Spiritual crises. We all go through them. However, I never heard of a "Mid-life spiritual crises" until I read "When the Heart Waits". Recommended to me by Author, Ken Gire, I saw myself as if staring into a mirror. Sue Monk Kidd, describes her own mid-life spiritual crises, with poignant, detailed stories of her own journey. Using the symbols that gave her a depth of understanding into her own soul, she takes you step by step down the path that completely altered her life, and set her on a new p Spiritual crises. We all go through them. However, I never heard of a "Mid-life spiritual crises" until I read "When the Heart Waits". Recommended to me by Author, Ken Gire, I saw myself as if staring into a mirror. Sue Monk Kidd, describes her own mid-life spiritual crises, with poignant, detailed stories of her own journey. Using the symbols that gave her a depth of understanding into her own soul, she takes you step by step down the path that completely altered her life, and set her on a new path and season of her life. Good quotes throughout as she describes her midlife experiences and crisis of spirit. I quote: "Sacred intent of life, of God-to move us continuously toward growth, toward recovering all that is lost and orphaned within us and restoring the divine image imprinted on our soul." Another quote: "...the confetti of scars and torn places we would like to be rid of...how did we ever get the idea that God would supply us with quick fixes, that God is merely a rescuer and not a midwife?" This is one of my top five favorite books of all time. I know something about waiting, and yet, I know nothing about waiting. This book reopened my eyes to the holiness to be found in waiting. 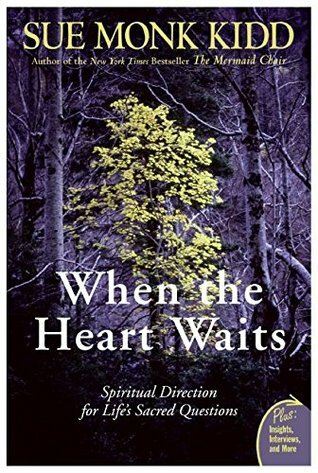 The first thing I have to note is that the title of the book, When the Heart Waits: Spiritual Direction for Life's Sacred Questions, doesn't quite fit. Very few questions are asked directly throughout the book and it offers direction only in a very broad sense. Having read the entire book, I *guess* I can understand how they chose the title, but frankly they could have done better. The book focuses on Sue Monk Kidd's personal experiences as she goes through a midlife crisis. Although this was the The first thing I have to note is that the title of the book, When the Heart Waits: Spiritual Direction for Life's Sacred Questions, doesn't quite fit. Very few questions are asked directly throughout the book and it offers direction only in a very broad sense. Having read the entire book, I *guess* I can understand how they chose the title, but frankly they could have done better. The book focuses on Sue Monk Kidd's personal experiences as she goes through a midlife crisis. Although this was the focus, I feel like much of what she wrote is relevant in any spiritual transition. I guess it's also important to mention that I read this book as a non-Christian but very spiritual person, and I'm only 25. The book was still relevant to me. Although I think there truly are some wonderful insights in this book, I read it mainly for the pleasure of reading the parts that were memoir. A lot of this book merely confirmed what I've read in other spiritual books lately and I collected a few good quotes. Wonderful... absolutely wonderful! I have my best friend from high school to thank for sending this to me almost three years ago. I have not been led to read it until now, and I am glad I... waited. Sue Monk Kidd is a truly gifted writer and describes my experience of mid-life spiritual transformation through the use of the main metaphor of butterfly metamorphosis. From resisting, crawling along in a diapause holding onto the old self, to being in a cocoon for the past 3 years... feeling the dar Wonderful... absolutely wonderful! I have my best friend from high school to thank for sending this to me almost three years ago. I have not been led to read it until now, and I am glad I... waited. Sue Monk Kidd is a truly gifted writer and describes my experience of mid-life spiritual transformation through the use of the main metaphor of butterfly metamorphosis. From resisting, crawling along in a diapause holding onto the old self, to being in a cocoon for the past 3 years... feeling the darkness and waiting as Christ was reforming in me. Spiritual transformation is never an easy or pretty process. Sue empathizes sharing her personal experience along with the experience and insights with those of countless great writers and theologians (Merton, Nouwen, St. Theresa of Avila, St. John of the Cross, de Chardin, de Caussade, de Mello, Eckhart, Kierkegaard) as she weaves scriptural references and apologetics into a catechism for mid-life metamorphosis. Psychiatrist Scott Peck says, "Pain won't kill you, but running from it might.". Here is one of the more valuable lessons I learned: avoiding pain, rather than having the discipline and courage to confront it and live it through, only compounds suffering in the long run. The escape hatches people create in attempts to avoid or numb pain can actually be worse than the experience of pain they sought to avoid in the first place." I love Kidd's novels, but this just is not my cup of tea. I realized that from the start, but thought it would be interesting to see what makes one of my favorite authors tick. However, at the halfway mark I'm calling it quits. There are a couple of thoughts worth considering, like the value of waiting, or being still and processing and feeling the spirit, and the concepts of "I" and "They" and taking action to help yourself (like: why didn't Rapunzel chop her own hair off to make a ladder to ge I love Kidd's novels, but this just is not my cup of tea. I realized that from the start, but thought it would be interesting to see what makes one of my favorite authors tick. However, at the halfway mark I'm calling it quits. Sue Monk Kidd articulates her spiritual and psychological struggle through her midlife journey. Her quests are grounded in the Bible, Christian spiritual writing, contemporary spitituality and psychology. She shares some profound experiences of personal spiritual breakthroughs. She compares the "waiting process" of becoming your "true Self' and giving birth to the Christ within as the catapillar developing in chrysallis of the cocoon. During this waiting time being nutured by Mother nature until Sue Monk Kidd articulates her spiritual and psychological struggle through her midlife journey. Her quests are grounded in the Bible, Christian spiritual writing, contemporary spitituality and psychology. She shares some profound experiences of personal spiritual breakthroughs. She compares the "waiting process" of becoming your "true Self' and giving birth to the Christ within as the catapillar developing in chrysallis of the cocoon. During this waiting time being nutured by Mother nature until ready to be transformed or (re)birthed into a butterfly. ( by a "mothering" God to teach us birth and rebirth). I love Sue Monk Kidd's way of writing. She is winsome and thoughtful and inspires me to think much more deeply about the world around me. This book, in particular, compelled me into a greater appreciation of waiting. Waiting is a spiritual practice in so many ways, and it's necessary to a robust life. I quoted many excerpts from this book in my small group on John Ortberg's book Soul Keeping. Believe it or not, the two books dovetailed beautifully! I wish we could give half-stars to books! :) This was a lovely little book, just not one that I felt super jazzed about by the time I finished it. For some reason, some of the anecdotes almost felt forced, and even some of the Bible quotes. It didn't always feel like an organic flow. My favorite parts, however, were the parts about the false selves and later, how she met and dismantled those false selves. This fall I re-read this wonderful book - it's even more powerful the second time. Sue Monk Kidd traces her journey through a mid-life crisis of spirituality using the caterpillar-to-butterfly metamorphosis to tie it together. She is so transparent about her struggles. I highly recommend it! After seeing Sue on Super Soul Sunday, I picked up this book. Maybe back at the end of 2015, early 2016. Her words & writing really urged me forward in owning my truth and being okay with changing my life path after age 40.